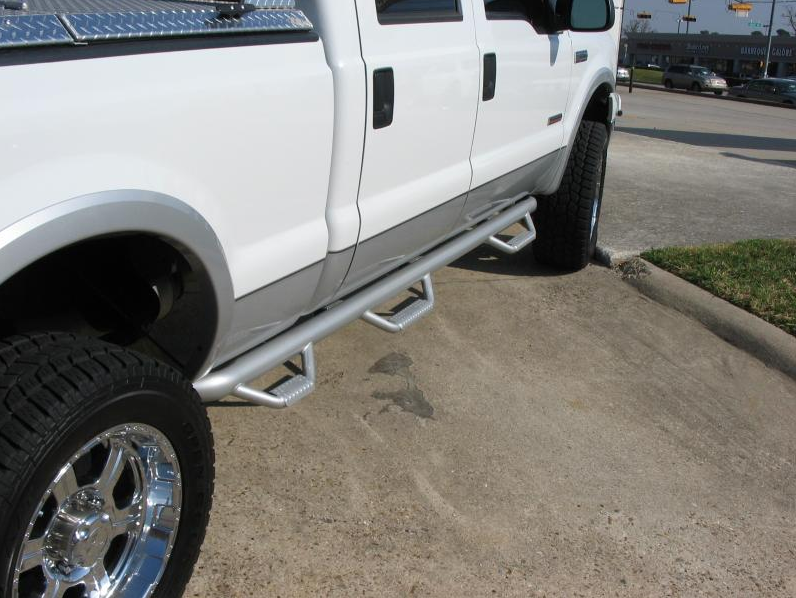 Step bars and running boards are among the most popular accessories we sell at Sound Depot and Performance, and for good reason. 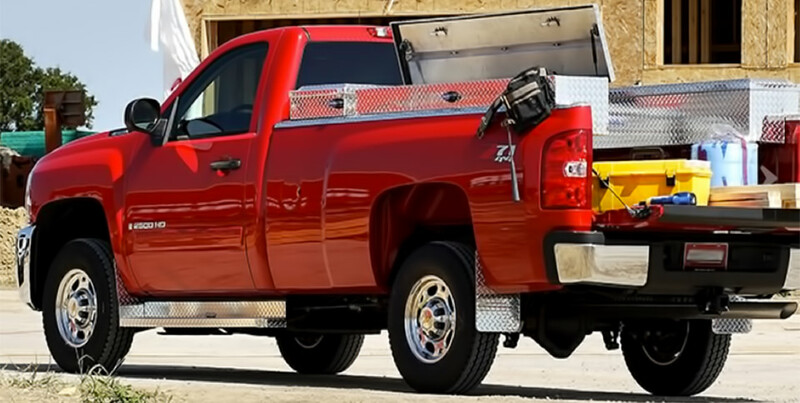 They dramatically improve the cosmetics of your truck or SUV, and they make it much easier for you and your passengers to enter and exit your vehicle. We are experts in that category, as we spend significant time every year on researching the best-value, highest-performing products available. 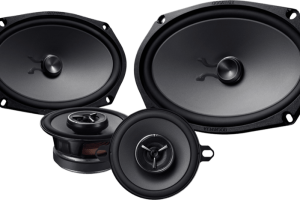 If a product does not meet the Sound Depot and Performance quality standard, we don’t sell it, no matter how popular it may be. Some of our most popular products are as follows. Power steps are a category that continues to grow in popularity. 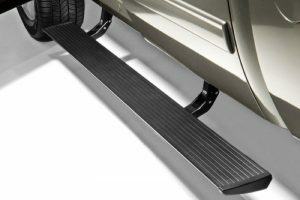 They are motorized steps that, when not in use, retract up tight against your vehicle for an almost invisible look. Here is how they work: You walk up to your vehicle and open a door. The power step motors down into position in less than a second, giving you a firm, secure place to place your foot. Depending on the model you choose, the steps come down 6 to 9 inches, giving you one of the lowest steps available. The board itself is several feet long and several inches deep. After you close the last door on that side of the vehicle, the steps retract back into place after two to three seconds. The benefits are incredible – you get all of the advantages of old-style running boards with none of the cosmetic drawbacks. As a bonus, they come with hidden LED lighting that will light up the steps and the ground below, letting you safely see where to place your foot. Nerf bars have been popular for decades now. In the early years, they were made of 3-inch round tubular steel that started right behind the front wheels and would extend to behind the rear doors. 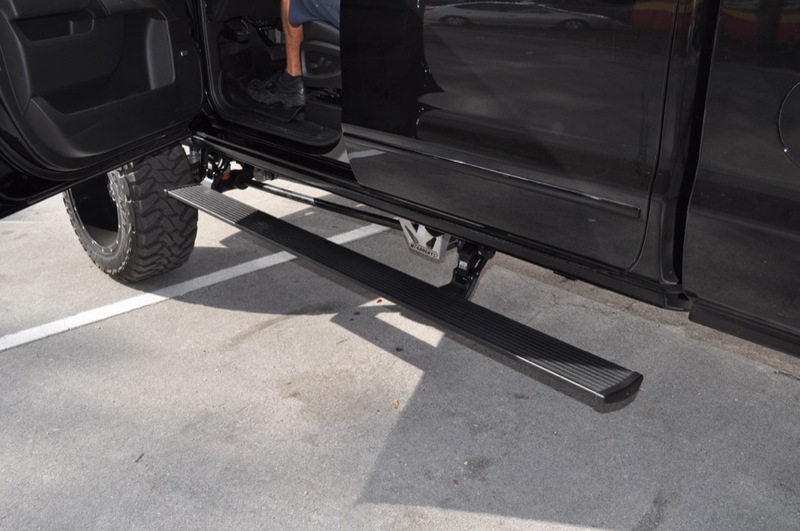 Recessed step plates were installed in strategic spots, giving you a secure place to step into the vehicle. Times have changed. They are now available in round, oval and square tubing in sizes ranging from 3 inches to 6 inches in diameter. 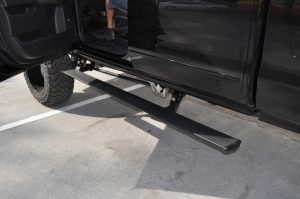 You can also get nerf bars that stop behind the rear doors or go all the way back to the rear wheels, filling the whole side of your vehicle. The two most popular finishes are black and polished stainless steel. N-Fab steps have burst onto the scene in these last several years, and continue to grow in popularity. To some people, they are known as the next evolution in nerf bar design. They have a very rugged, mean look that many truck owners like. The design starts with a round tube that is tucked up tight against the body of the vehicle. A welded hoop at each door extends down several inches, giving you a great place to put your foot when entering and exiting your vehicle. 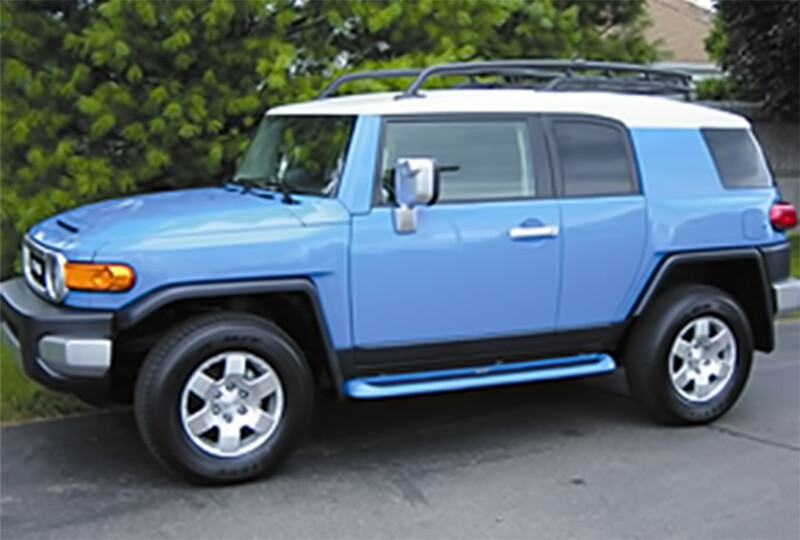 They come in three different styles: cab-length, wheel-well-to-wheel-well and bed-access. The bed-access model is a unique design that takes the wheel-well-to-wheel-well design and adds a third step in front of the rear tire. You now have an easy way to access cargo from the side of your bed. The most popular finishes are gloss black, textured black and polished stainless steel. 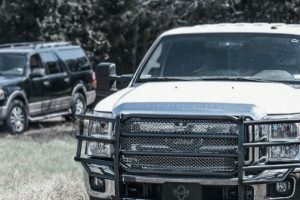 If you are looking to build an off-road warrior and replace the bumpers on your truck, the textured black will continue that theme perfectly for you. Running boards have been around for what seems like forever. They come in two distinctly different styles. 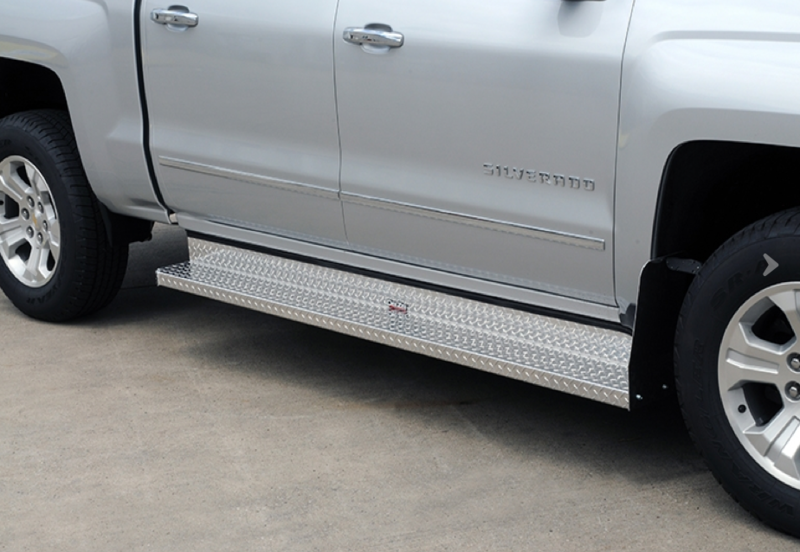 If you own a commercial vehicle or live on a farm, the diamond-plated running boards are a popular choice. They are rugged, stand up to years of abuse, and give you a safe, secure entry point into your vehicle. These boards may also be for you if you are looking to create a vehicle with old-school styling. 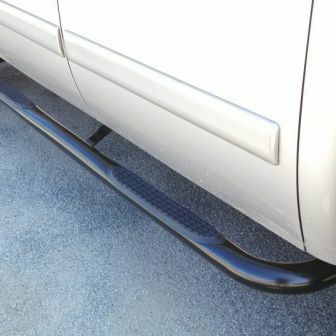 And then we have the new styles of running boards. Modern trucks and SUVs are much sleeker and rounded than in years past, so manufacturers have changed their designs to reflect modern styling, resulting in running boards that have a smooth, flowing look. They add a touch of class to luxurious SUVs, making them look even more impressive. They often start out behind the front wheels, tucked up tight against the body. 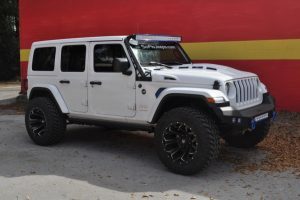 They mold out smoothly to give the front and rear passengers secure steps and then mold back in tightly against the body in front of the rear wheels. The most popular finishes are black, polished stainless steel and combinations of both. 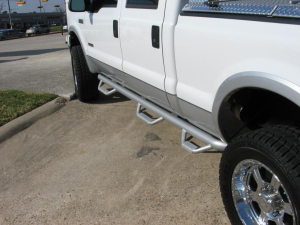 Once you have decided that you need a good set of truck steps, you need a quality installation. 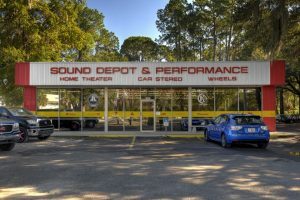 Sound Depot and Performance employs the finest technicians in the area, and will treat your vehicle with the utmost care. We will perform the job correctly the first time so you will have years of trouble-free use from your new steps. We invite you to stop by our clean, modern showroom with your vehicle and let us get to know you better. 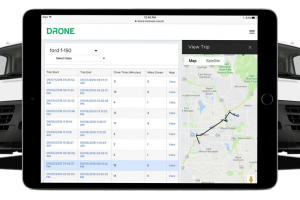 One of our team members will take as much time as needed to help you choose the best products for your unique needs.